December 31, 2017 marked the transition into a new phase for our family. James’ mom (age 95) was moved into her daughter’s place. Thank God for my sister-in-law and her husband who remodeled and “senior proof” their basement apartment with an outside entrance. Now mom does not have to climb stairs to her 3rd-floor flat. That transition allowed James and me the freedom to participate in a vision trip to South Korea with other ethnic ministry leaders in early April. One place we visited was near the DMZ (Demilitarized Zone) near the 38th parallel, the line dividing North and South Korea. 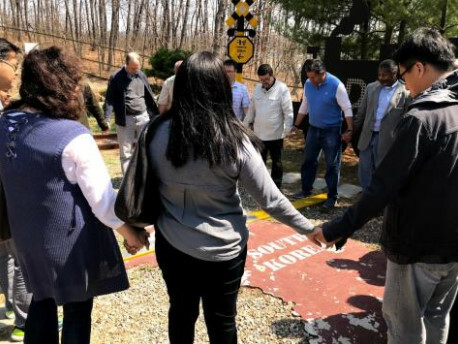 Imagine praying with a group from all nations for the then upcoming summit between the North and South Korea leaders. Here is a photo taken by Resonate Global Mission of the Christian Reformed Church of North America (CRCNA). As explored in the feature article "Life Stages" this month, life goes through stages but we could still grow by getting out of our comfort zone at any age! I'm grateful for both my mother-in-law and my own mother. Although my mommy passed away in 1975 at age 48, I still remember her love. You may read about "Love that Reconciles" written in Chinese (中文文章 - 主動和解的愛). Let’s bless others with the love of Christ! You may read the May 9th 2018 Newsletter by clicking HERE.